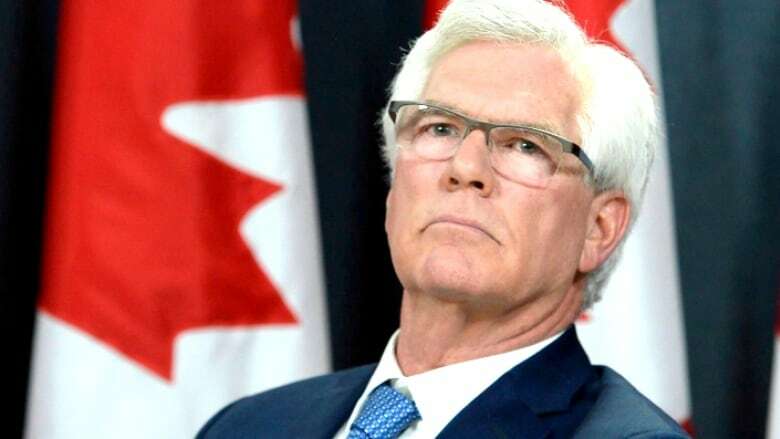 As Natural Resources Minister Jim Carr explores avenues in China to expand foreign investment in the oilsands, his government is being accused of allowing Chinese takeovers of Canadian firms with little regard for national security. Carr is on a five-day trade mission to China, pursuing partnerships and new markets for the energy and forestry sectors. The trip comes as the two countries pursue exploratory free trade talks, and the federal Liberals adjust their foreign policy to confront the headwinds of Donald Trump's "America First" doctrine. Carr's message? Canada welcomes Chinese investment, including in the oilsands, he told a conference call from Beijing — a departure from the previous Conservative policy of keeping state-owned-enterprises (SOEs) out of Canada's energy sector. "We think there is opportunity and we laid out along with experts from the industry what we believe to be Canadian opportunities for them," Carr said. "Chinese investors are no different than investors from anywhere else. They look at costs they look at prices and they make their investment decisions." In 2012, after the China National Offshore Oil Corp. was allowed to buy Calgary-based Nexen Inc., then-prime minister Stephen Harper put strict limits on SOEs investing in the oilsands, fearing foreign government influence inconsistent with Canadian policy. Harper's policy called for assessing investment proposals and takeover bids on a case-by-case approach, granting approval only in exceptional circumstances. Talking to China about investment opportunities is no different, and will still be done on a case-by-case basis, Carr argued. "The Canadian government is prepared to talk to the Chinese government about investments in most sectors of our economy," he said. "I don't think that represents a change in public policy but as a general expression of our willingness to talk." Chinese investors became leery of the oilsands when oil prices plunged in 2014. The Chinese ambassador to Canada said in April that unless prices rebound, their interest is unlikely to be rekindled. The Conservatives, meanwhile — now sitting in Opposition to the governing Liberals — have accused the government of currying favour with China to the detriment of Canada's national security — accusations that were flying again Thursday. Tory MPs pounced on media reports that the government had recently agreed to let China's Hytera Communications acquire Vancouver-based Norsat International Inc., after only a preliminary security screen. Norsat makes satellite communications systems used for national security and defence purposes. It has a number of government customers in both Canada and internationally, including the Canadian Coast Guard and the Pentagon. Economic Development Minister Navdeep Bains said the review was thorough and didn't raise enough concern to merit a full review by the Canadian Security Intelligence Service or the Department of National Defence. "We always have and always will protect our national security," Bains said Thursday in question period. Nonsense, countered Conservative House leader Candice Bergen and NDP Leader Tom Mulcair, who accused the Liberals of putting Canada's national security in jeopardy. The Hytera-Norsat approval comes just three months after Bains gave the go-ahead to Hong Kong-based O-Net Communications to buy out Montreal's ITF Technologies. ITF makes fibre-laser technology for communications and industry which can be used in direct-energy weapons. The former Conservative government originally approved the deal in 2015, but changed its mind after a national security assessment, saying it feared handing over advanced western military laser technology to the Chinese. Bains overturned that decision last fall and ordered a new national security review. It approved the sale in March; Bains said there were conditions imposed on the deal to protect national security. The Liberals are being "naive" about the security risks of Chinese foreign investment, much like the Conservatives in their first years in power, said Michael Byers, Canada Research Chair in global politics and international law at the University of British Columbia. The national security test added to the Investment Canada Act by the Conservatives in 2009 is there for Canada's protection, said Byers, calling it "incomprehensible" that the Trudeau government is not following it. He said he understands the diplomatic pressure from China and the political pressure to diversify markets because of what is happening in the United States, but turning to China without proper vetting is just plain dangerous, he said. "Why wouldn't you do a full review when on its face this proposed sale is crying out for such a review?" Conservative spokesman Saro Khatchadourian said given the ITF and Norsat deals, it's hard to trust the Liberals to properly evaluate foreign investment in anything, including the oilsands. "This government continues to put our national security at risk by allowing the Chinese unprecedented access to key, sensitive technology that compromises our national security," Khatchadourian said.